Men are fairly simple creatures with fairly simple needs. Yet women often find themselves frustrated trying to understand those needs in order to improve their marriages. Many wonder, "What does he expect from me? I'm doing everything the best I can. Doesn't he know I'm at the end of my rope here?" Relationship expert Rick Johnson ends the guessing game, giving women an open and honest look inside the world of a man's needs and helping them understand how best to use their influence to have a satisfying and exciting relationship. Rick delves into the not-so-mysterious-after-all world of a man, highlighting his need for respect and admiration, his sexual desires, his communication style, his work, his emotions, and even his relationship with the "other woman"--his mother. Women will appreciate Rick's candor, humor, and insight as they discover that the marriage of their dreams is closer than they ever thought it could be. 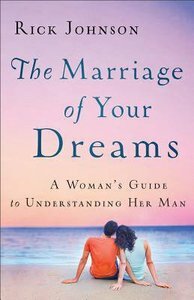 About "The Marriage of Your Dreams"